(Newser) – Yawning doesn't mean you're bored, it just means you've got one big, hot brain in your head, according to a study published Tuesday in Biology Letters. 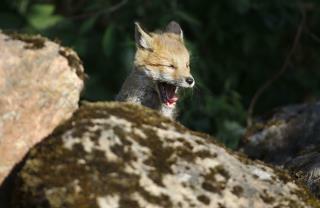 The Atlantic reports researcher Andrew Gallup had his students go online to collect videos of animals yawning (not a hard task considering yawning animals are the dang cutest). He then found he was able to predict the brain weight and the number of brain cells in the cortexes of various animals based on their yawn length. “We were just really blown out of the water,” Gallup tells the Atlantic. “It’s such a strong predictor.” Perhaps surprisingly, body and mouth size had nothing to do with yawn length. The size of the brain one does not make smarter. Yoda. My pup yawns all the time, she's brilliant.